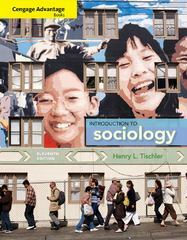 Cengage Advantage Books: Introduction to Sociology 11 Edition Packed with current examples you can easily relate to, Tischler's INTRODUCTION TO SOCIOLOGY, 11E delivers comprehensive, up-to-date coverage in a succinct and afforDOle format. The author begins by equipping you with tools for success, including tips for how to read, study, and take tests more effectively. A built-in study guide and practice tests ensure thorough understanding. The text threads two basic ideas throughout: sociology is a rigorous, scientific discipline, and basic knowledge of sociology is essential for understanding social interaction in many work and social settings. With its streamlined 16 chapters, INTRODUCTION TO SOCIOLOGY, 11E delivers cutting-edge coverage that is concise yet thorough--and makes sociology completely accessible. Available with InfoTrac Student Collections gocengage.com/infotrac.